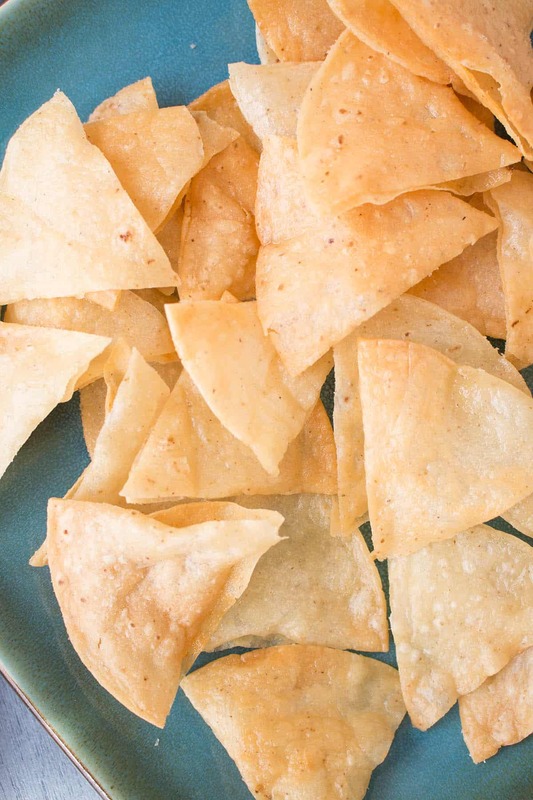 Make your own crispy homemade tortilla chips at home with this recipe. All you need is a bit of oil, corn tortillas, and salt. They’re so much better when you make them on your own. They are best lightly fried, but you can also bake them. 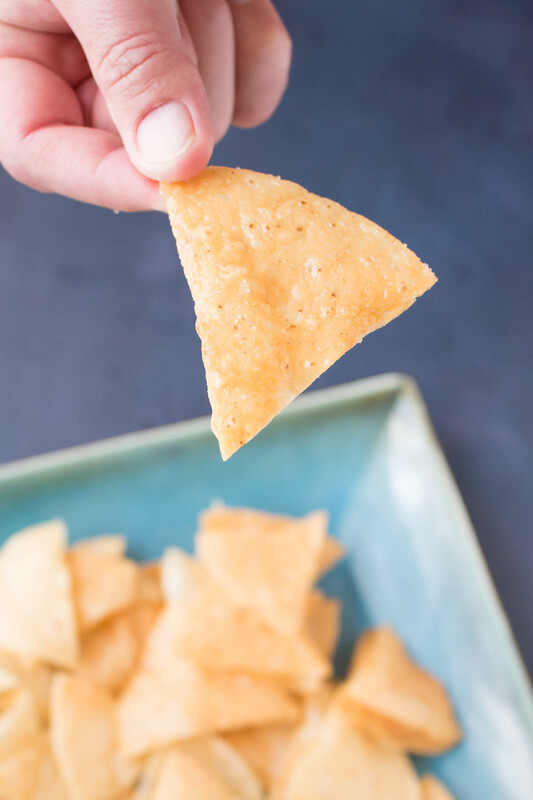 Making your own crispy tortilla chips at home is one of those basic skills you’ll wish you had all your life. In fact, it’s so easy, you probably COULD have had it all your life but never had the opportunity to try it. I know, it’s super easy and convenient to grab a bag of tortilla chips from the grocery store, and hey, there are some pretty good ones out there. But there is something about freshly made tortillas that can’t be matched by any store bought product. It’s like tortilla chips you get at your favorite Mexican restaurant. You can tell when they’re freshly made, just popped out of the fryer, still glistening with oil and perfectly warm with granules of salt clinging to every nook and bubble. For such a simple thing, it’s the perfect bite. And yeah, you can make them at home the same way. You can use stale tortillas for making tortilla chips. In fact, stale chips are slightly better because they are dryer, and the moisture can sometimes interfere with the frying or baking process. 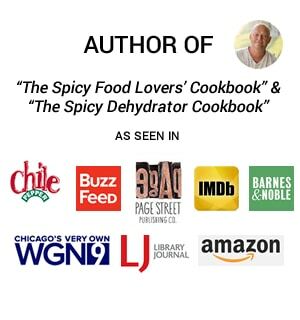 Personally, I have made tortilla chips from fresh corn tortillas, straight from the bag, and haven’t had issues, but you’ll probably get better results from stale tortillas that are a bit dried out. You can either slice your tortillas into wedges, or cook them whole for different applications. 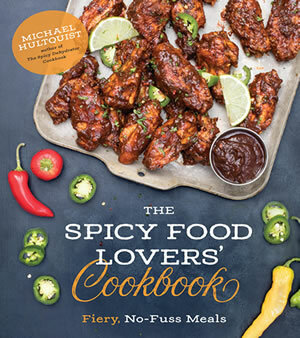 I cook mine whole for recipes like tortilla stacks, and slice them for recipes like chilaquiles. The choice is yours and does not affect the end result. Stay away from olive oil. 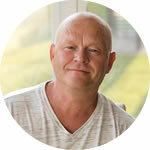 It is best to use a neutral oil with a higher smoking point. Canola oil is great, though you can use any neutral oil, like grapeseed oil or avocado oil. If your oil starts to smoke, remove it from the heat and let it cool a bit. I personally prefer fried tortillas, as they are much crispier, though you can bake them for a healthier version that does not include the oil. You will still achieve crispiness, though they will be drier. You can also microwave your chips, about a minute or so per side, though I’ve never been satisfied by microwaved tortilla chips. Meh. For frying, first, add the canola oil to a wide pot and heat to medium (should measure 350 degrees F). Do not let it boil or smoke. Next, slice the tortillas into 6 wedges. Set the wedges in a single layer in the oil. Fry them in the oil in batches a couple minutes per side, flipping here and there with tongs, until they begin to turn light brown. Finally, remove and drain the excess oil on a paper towel lined plate. They’re essentially deep fried. Dash them with salt while they are hot. You can also squeeze on some fresh lime juice. For baking, heat oven to 350 degrees F. Then, simply slice the tortillas into 6 wedges and spread them out on a baking sheet. Bake them at 350 degrees F about 5 minutes, salt them, then flip and bake another 5-10 minutes, until they brown up slightly and begin to crisp. Finally, sprinkle with salt and enjoy. Super easy! So much better than store bought chips. Can You Make These with Flour Tortillas? 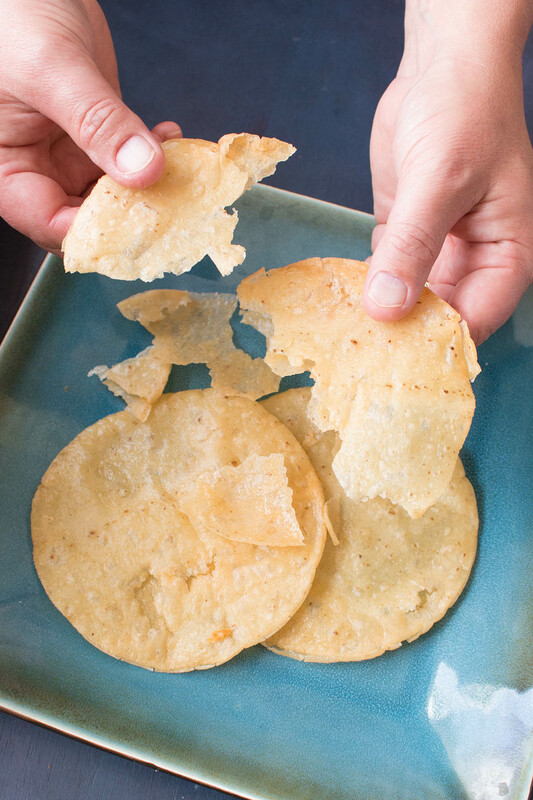 Yes, you can make crispy baked or fried tortilla chips with flour tortillas. Just follow the exact same directions in the recipe cards, but use flour tortillas. I personally prefer using corn tortillas, but the process works the same. Homemade tortilla chips are best when eaten right away, straight out of the oven or the frying pot. After a bit of cooling time, of course. However, you can store them in a paper bag for a few days and they will retain their crispiness. Just fold the top of the bag down to keep them fresher. I have also placed leftover tortilla chips into a sealable baggie and kept them in the pantry. Sealed, of course. They were still crispy and flavorful a few days later. They do eventually go stale, though. How can I count the ways! Do I even need to make suggestions? I know you already LOVE corn tortilla chips! Come on! What’s not to love? But just in case you DO need ideas, here are a few links to help you out. Oh yes! I DO love my homemade tortillas. Be sure to pull out this recipe for your next party or game day celebration. Everyone loves a bagful of crunchy chips. Especially with all of your awesome homemade dips and homemade salsa recipes! Here are the recipes for you to print up. Enjoy! This makes me never want to buy store bought tortilla chips again. Not only are they fresh, but they’re perfect salty that just POPS. Also, they’re so good warm right from the pot. YUM. If you enjoy this recipe, I hope you’ll leave a comment with some STARS. Also, please share it on social media. Don’t forget to tag us at #ChiliPepperMadness. I’ll be sure to share! Thanks! 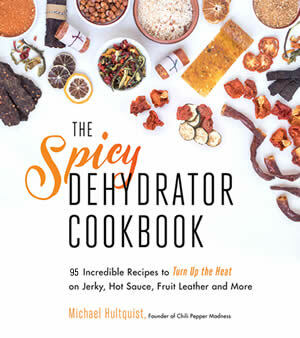 — Mike H.
Printable Recipe Card for the Frying Version – Extra Crispy Tortilla Chips! 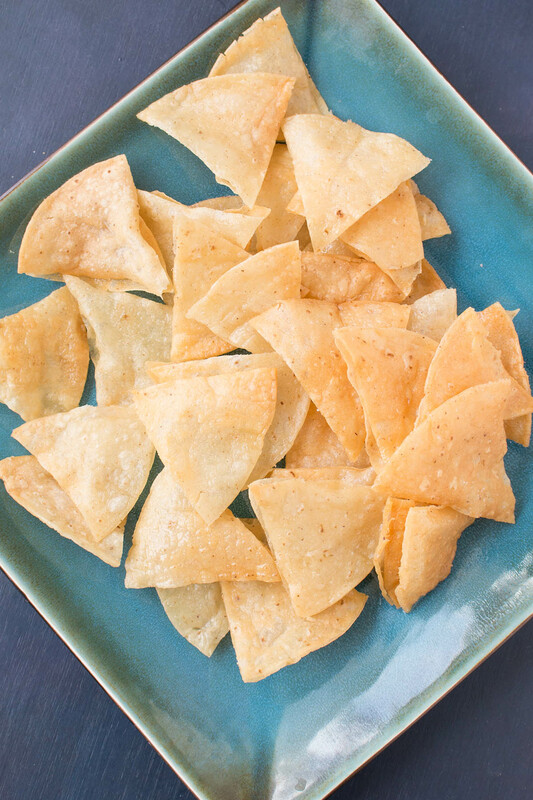 Make your own crispy homemade tortilla chips at home with this recipe. All you need is a bit of oil, corn tortillas, and salt. They're so much better when you make them on your own. Add the canola oil to a wide pot and heat to medium (should measure 350 degrees F). Do not let it boil or smoke. You know it’s ready when you add a crumb of tortilla and it sizzles up. Slice the tortillas into 6 wedges and fry them in the oil in batches a couple minutes per side, flipping here and there with tongs, until they begin to slightly brown. Remove and drain them on a paper towel lined plate. Dash them with salt while they are hot. Printable Recipe Card for the Baking Version – Extra Crispy Baked Tortilla Chips! Make your own crispy homemade tortilla chips at home with this recipe. All you need is a bit of oil, corn tortillas, and salt. They're so much better when you make them on your own. They are best lightly fried, but you can also bake them. Slice the tortillas into 6 wedges and layer them on a baking sheet. Brush them with the oil. Bake about 5 minutes. Flip and generously salt them down. Bake another 5-10 minutes, until they begin to brown nicely. Remove, cool a bit, and blast them once more with salt.